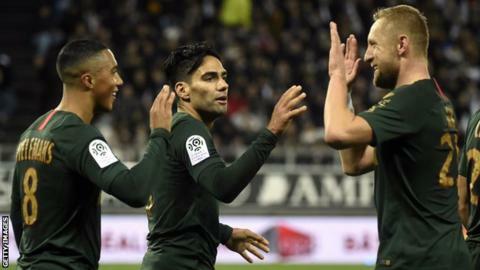 Monaco moved out of the Ligue 1 relegation zone as two Radamel Falcao penalties gave them victory at Amiens. The Colombia striker, who had missed twice from the spot this season, made no mistake after Emil Krafth fouled Benoit Badiashile. Bakaye Dibassy was sent off for a foul on Falcao late on, before Falcao scored again in stoppage time. Thierry Henry's Monaco have now won two of their past three games to climb to 17th in the table. Match ends, Amiens 0, Monaco 2. Second Half ends, Amiens 0, Monaco 2. Goal! Amiens 0, Monaco 2. Radamel Falcao (Monaco) converts the penalty with a right footed shot to the bottom left corner. Penalty conceded by Régis Gurtner (Amiens) after a foul in the penalty area. Penalty Monaco. Pelé draws a foul in the penalty area. Diego Benaglio (Monaco) is shown the yellow card. Delay in match Radamel Falcao (Monaco) because of an injury. Bakaye Dibassy (Amiens) is shown the red card. Foul by Bakaye Dibassy (Amiens). Radamel Falcao (Monaco) wins a free kick in the defensive half. Corner, Amiens. Conceded by Benjamin Henrichs. Attempt missed. Radamel Falcao (Monaco) left footed shot from the right side of the box misses to the left. Assisted by Benjamin Henrichs. Khaled Adénon (Amiens) is shown the yellow card for a bad foul. Foul by Khaled Adénon (Amiens). Han-Noah Massengo (Monaco) wins a free kick in the attacking half. Saman Ghoddos (Amiens) wins a free kick in the defensive half. Foul by Radamel Falcao (Monaco). Benjamin Henrichs (Monaco) wins a free kick in the attacking half. Youssef Aït Bennasser (Monaco) is shown the yellow card for a bad foul. John Stiven Mendoza (Amiens) wins a free kick on the right wing. Foul by Youssef Aït Bennasser (Monaco). Attempt missed. Khaled Adénon (Amiens) header from the centre of the box is high and wide to the left. Assisted by Thomas Monconduit following a set piece situation. Prince (Amiens) wins a free kick in the attacking half. Offside, Amiens. Thomas Monconduit tries a through ball, but Saman Ghoddos is caught offside. Ganso (Amiens) wins a free kick in the defensive half. Foul by Stanley Segarel (Amiens). Ronael Pierre Gabriel (Monaco) wins a free kick in the defensive half. Attempt missed. Prince (Amiens) right footed shot from outside the box misses to the right. Assisted by Khaled Adénon. Substitution, Amiens. Stanley Segarel replaces Eddy Gnahore. Offside, Monaco. Kamil Glik tries a through ball, but Radamel Falcao is caught offside. Khaled Adénon (Amiens) wins a free kick in the defensive half. Prince (Amiens) wins a free kick in the defensive half. Attempt saved. Pelé (Monaco) right footed shot from the left side of the box is saved in the top centre of the goal. Assisted by Benjamin Henrichs. Foul by Mathieu Bodmer (Amiens).